I was looking through a website I usually visit for their repository of arcade manuals and I came across a collection of Industrial Design artwork from Atari that someone had acquired. Being a fan of the arcades and games of the early 70’s and 80’s, especially Atari, I found them quite fun to look through. I pulled out a few of the images dealing with the design ideas for an Atari Arcade Design Concepts. It appears that the images came for an earlier revision of the website atarigames.com. I don’t see them on the current website but they do have a lot of other images and documents from Atari there. The next two have a futuristic space port feel to them. I like the theme but I’m not sure it would feel the same with the game cabinets that were to come soon. Atari got away from the fiberglass and molded plastic look pretty early on and went to the more cost effective wood box. In my opinion it’s a good look though. The next one seems to be a tiki hut inspired all pong arcade. It appears they have barrel pong against the back wall, dual pong stations up front and maybe a pong/counter top in the middle there. I’m not sure how long this place would have stuck around. The last image is the outside of Atari Adventure. It’s a cool looking place that for some reason seems to attract catalog models. There are quite a few more of these Atari Arcade Design Concepts sketches at Atari Artwork. The rest are mostly prototype game cabinet design. If you like that stuff you should take a look. I do not just want to play games there. I want to live there. A Tiki arcade? This would, undoubtedly, edge Disney for the Happiest Place on Earth. Must go acquire funding and get an architect. Love this post! Awesome find…and I agree with The Retroist, I would live there! Man, great find. I want that Atari apron the change girl is giving. And I do live here…in my mind…this is what it looks like. Not only does it look like a great place to live but to also hook up with hot chicks! Looks like hot chicks LOVE the Atari arcades! Gah! I just wet myself! Posts like these make me wonder if I’m living in The Matrix. And some higher power is just messing with me. I dunno what excites me more: that it’s the perfect Atari recreational center (and possible living quarters, indeed) or that it seems to be located in a futuristic mall. If there’d be zombies as well, my head woulda ‘sploded. From the time and style, this had to have been a pet project for Nolan Bushnell. Since Corporate Atari never got around to making their own arcades, Bushnell must have decided it was okay to make his own arcade/amusement center franchise in the form of Chucky Cheese. Man…we have a guest staying at where I work that I kid you not is a Professor of Physics and has made it his personal goal to make time travel a reality. I’m going to ask him when he checks out if he succeeds if he would be kind enough to make Atari Adventure a reality! Interesting. I see the “barrel theme” pop up again in one drawing. 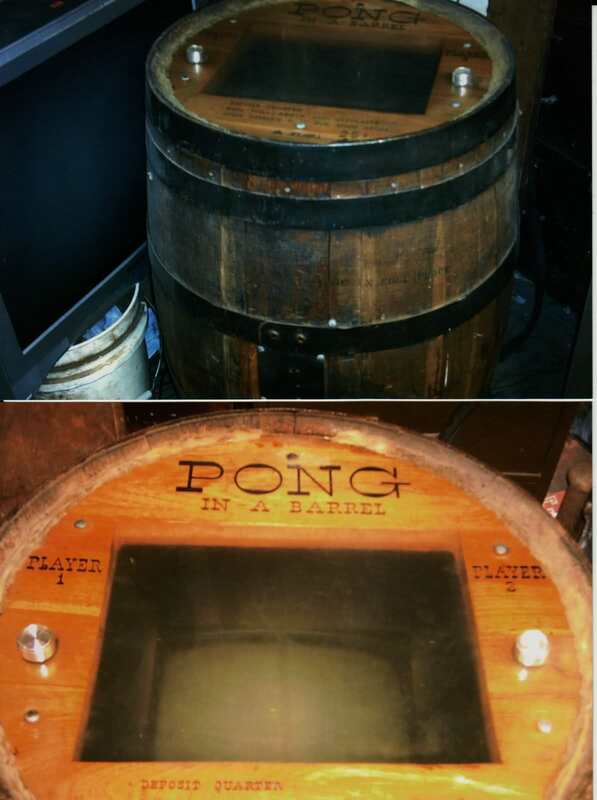 The earliest pong machines were set up on barrels, and the Pizza Time Theater (a Nolan Bushnell enterprise) I saw had barrels as decor. Someone’s brother-in-law must have run a barrel factory. I think they must have sold the remaining stock to Nintendo for use in Donkey Kong. It really is a shame that a lot of pioneering American companies are a shell of their former selves. These designs are by people who have never run successful arcades. Successful arcades would pack as many machines in as possible. They would also have food, drink, etc. When I see these empty designs I think of how every time the public libraries are remodelled there’s less actual books.